I happened to have a few pictures to illustrate the steps from beginning to end, so thought I’d share them with you. 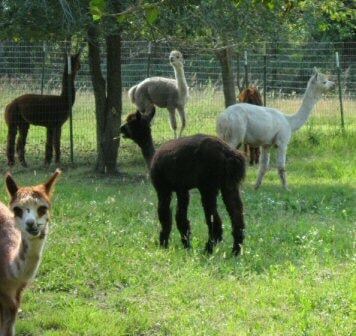 It all started with the visit to a local alpaca breeder two years ago (Sunflower Alpaca Farm, shortly before they moved to Fort Scott, KS). I was completely charmed by the animals, and took quite a few pictures. 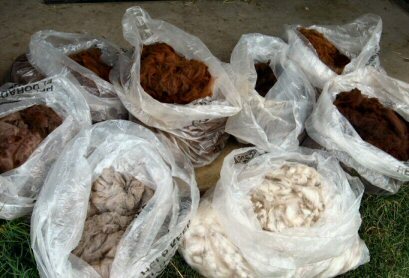 Of course, I had to buy some wool in all the different colors! Add white to those shown above, and you’ll have all the colors I had to work with. Once I started knitting swatches, the light grey turned out to be a much greater contrast to the white than I had expected, so I blended two other colors to use in between. With all the ripping (I probably knit enough for a third glove!) it took longer than I had hoped to finish the gloves I’d planned from the beginning. After an all-nighter, I did get them finished just in time to check them in at the state fair. 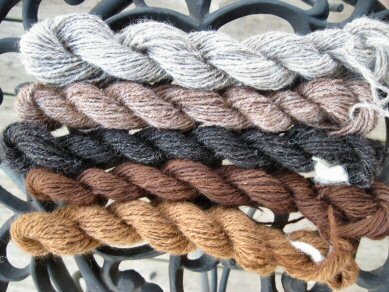 I may find out tomorrow how they placed in the new ‘item-knit-of-handspun-yarn’ class, and will let you know. 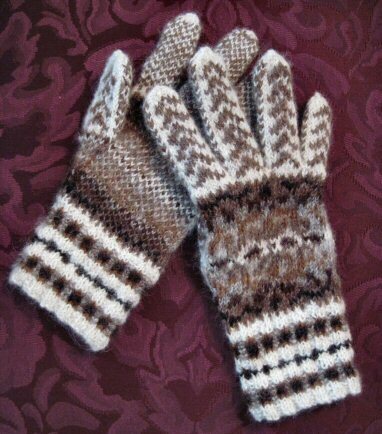 But whatever happens there, I’m delighted with my first pair of gloves, and will definitely knit more! UPDATE: I just heard from a friend – my gloves won the class! There was at least one other entry, and I hope the class will have even more entries next year! *End of post* I see that there is advertising below, at least on some views. Please feel free to ignore it!! Your gloves are beautiful. Congratulations on the win! Gorgeous gloves. Congratulations on the well-deserved win. Thank you all! And Eva, just think – you were there at the beginning! So beautiful! And must be amazingly warm!